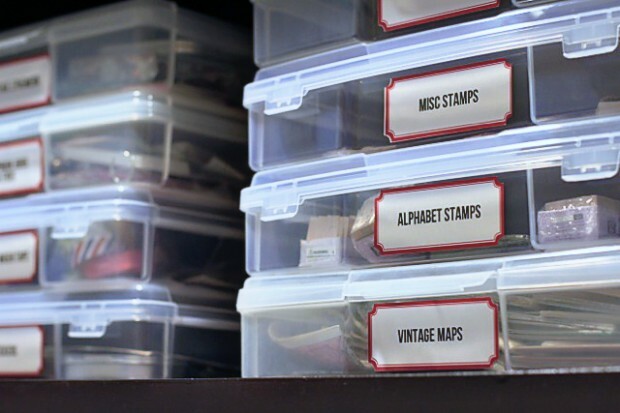 Organizing one’s craft room or craft stash can be an extremely personal, and in some cases, (cough my own cough) overwhelming and painful undertaking. 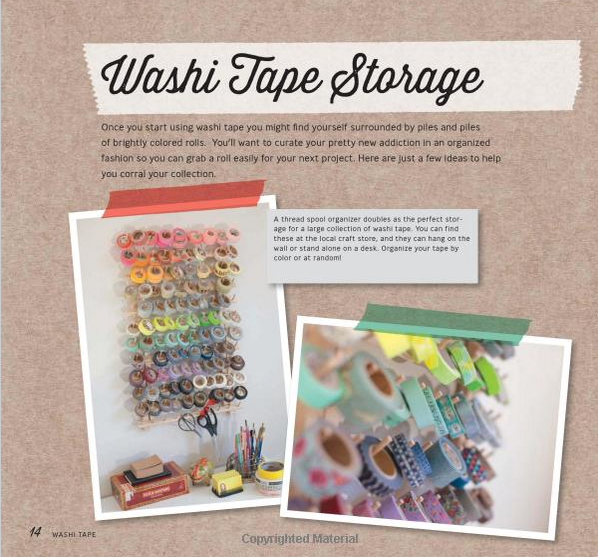 Whether you are a (pardon the pun) dyed-in-the wool knit or crochet supply hoarder, an obsessive fabric fanatic, a diy centerpiecer, have a passion for paper crafts, or, and perhaps, the most dangerous cocktail of clutter-creating makers, the pan-crafter, there are some basic tips, and organizational tools to make this year a more organized and ultimately, stress-free year for creating. Sure, you could spend hours on Pinterest gazing upon the pristine workspaces of others, or, you could read the round-up below which includes some practical and do-able tips from a few crafty names you may recognize, to make areas of your craft stash more usable. 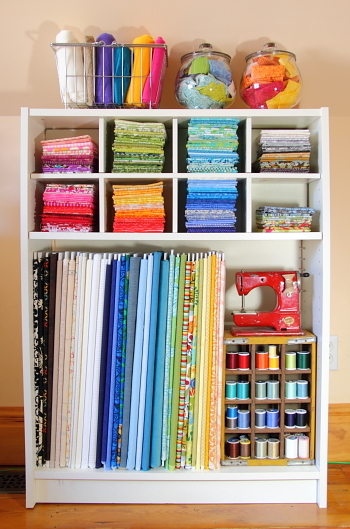 This converted Ikea bookcase has room for bolts, folded stacks and bonus, glass jars that make fabric scraps look classy. See more here. 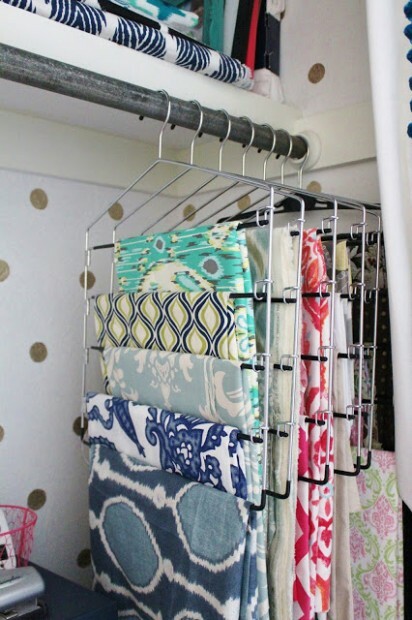 Tiered pants hangers = brilliant hanging fabric solution! Other tips available here. If rolls of beautiful fabric are your thing, then you can recreate a staircase lined in said beautiful rolls of fabric. I fear this would only encourage me to buy more fabric… but you may have more will power than I. Either way, check out the whole project at Going Home To Roost. Knit? Crochet? Latch hook? Weave? Macrame? Lucet? 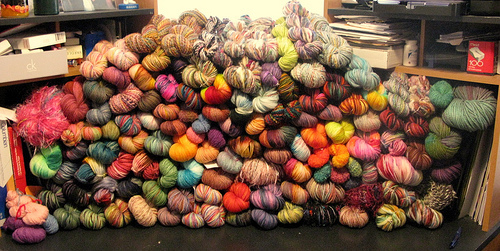 Whichever yarn-related poison you pick, I’m betting good money that there is a fibrous mountain in your possession, which could benefit from some attention and organization. I can’t be the only one in this predicament. Love that tip. And totally do-able right? “As you might imagine, I have a massive stash, and I have moved it with me all over the country. It feels like my most valuable possession, since it’s a living history of my 10-year career in yarn. It started at Webs, where the already low prices were rendered ridiculously tempting with an employee discount. Some of my favorite yarns are the ones acquired during my Berroco days, yarns that were never even named. 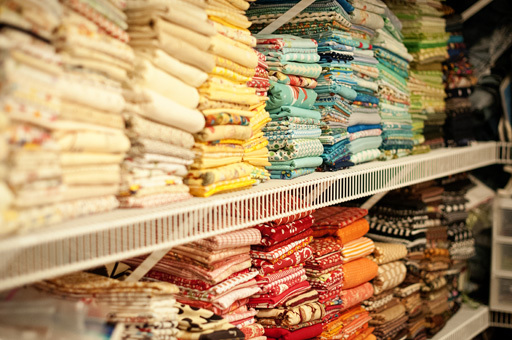 We had to pass on a lot of things that were just too expensive or strange to bring to market, but mills have to make at least a bag or cone of a sample yarn, and I pounced on many of them. Perfect, cost-effective storage solution. 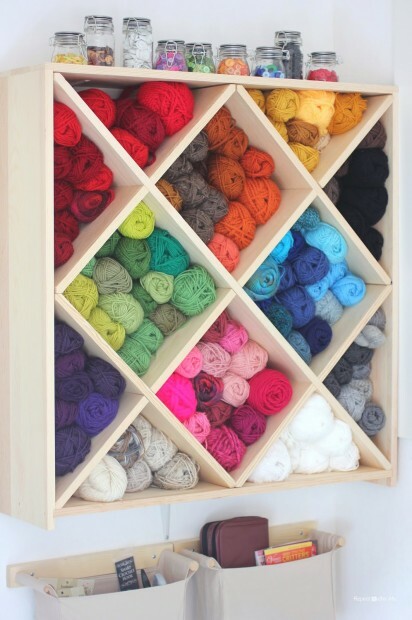 Ok, ready for some inspirational yarn storage pix? Hope you are sitting down. 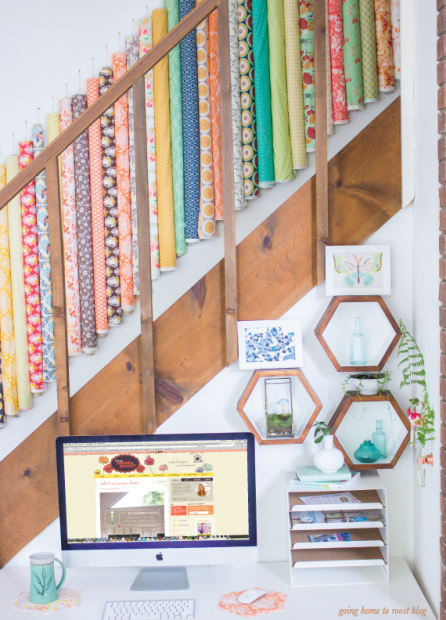 This easy tutorial from Repeat Crafter Me makes your stash the star of your workspace. Pegboard organization? A rainbow of yes, please. Get the full, and enviable tour at: Knits for Life. Looking for a load-bearing yarn wall? Come on, that’s just practical! 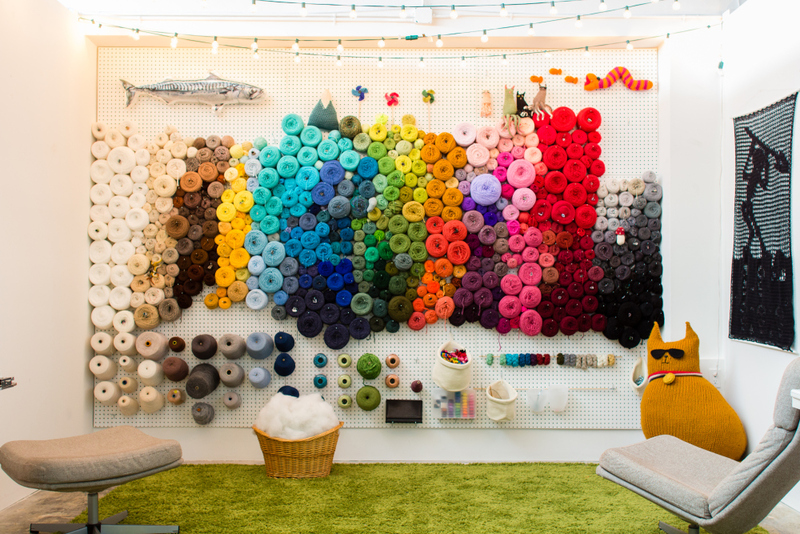 Watch in amazement as this room is made into a yarn-lover’s fantasy over on Lucky Hanks. Are you a mixed media artist? 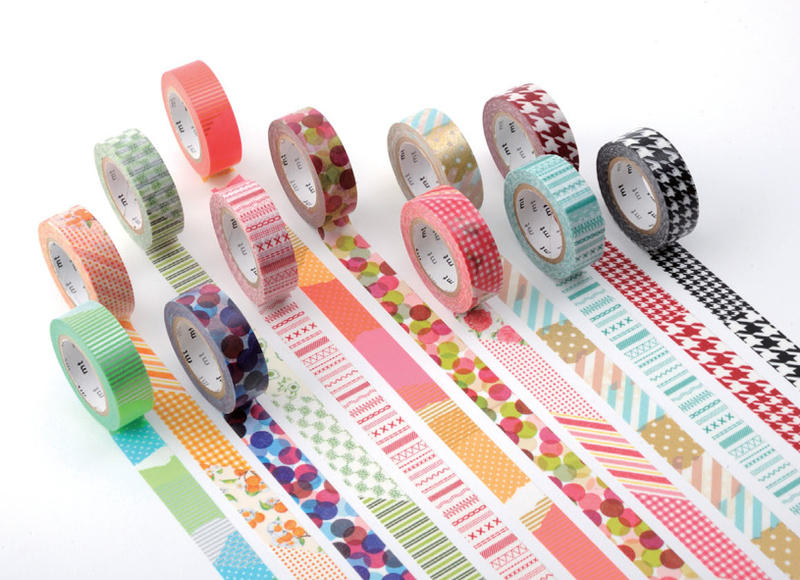 Has your personal mantra changed in the last few years from “Put a bird on it” to “Put Washi Tape on it”? That’s fine. Admitting your addiction is the first step. 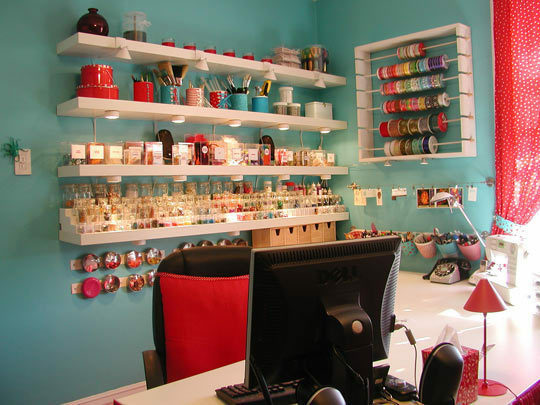 The second step is arranging your collection of spooled splendor in a way that allows you to gaze upon your lovely adhesives while showing off your keen eye for color. 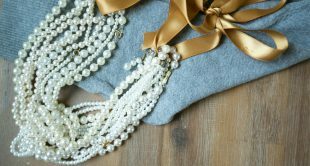 For the remainder of your spool-related crafts (I’m looking at you, ribbon and gift-wrap) there are loads of way to make it easy to access what you need. Here are a few of my top picks from the web. Got a thin ribbon surplus? See the rest of this (minty) fresh up-cycling tutorial on Prudent Baby. Looking for a wrapping station or place to store your large gift-wrap ribbon, wrapping paper rolls or butcher paper? I like the idea of this hidden station. 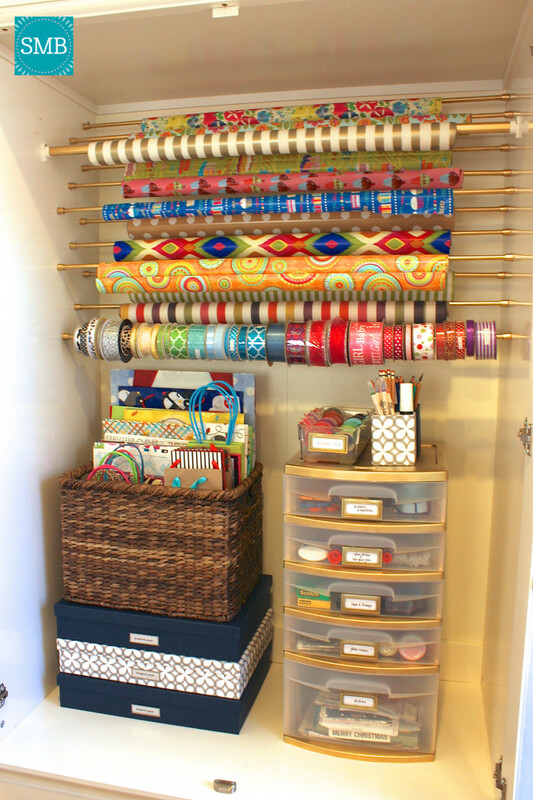 Don’t have the closet space for a wrapping station? Me either. 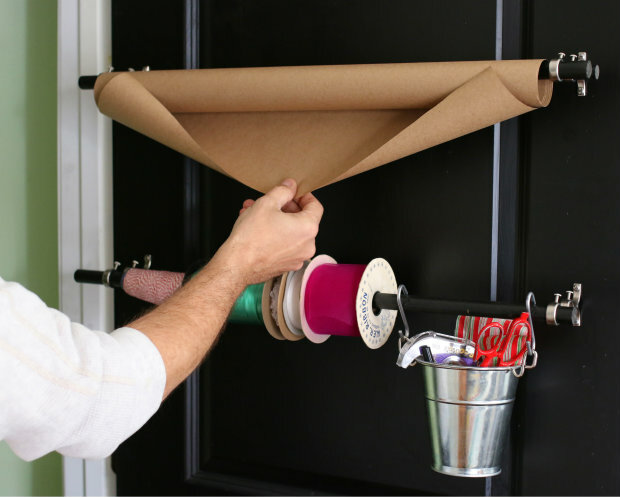 I do happen to have a few doors in my home and dedicating one to a DIY that would keep my clutter at bay sounds like a fine idea. Here’s the full how-to. So you make/own/hoard everything. You art journal, you sew, you knit, you’re into kitsch, and decoupage. I get it, your craft stash looks more like a Michaels (without the helpful aisle markers, shelving and staff). 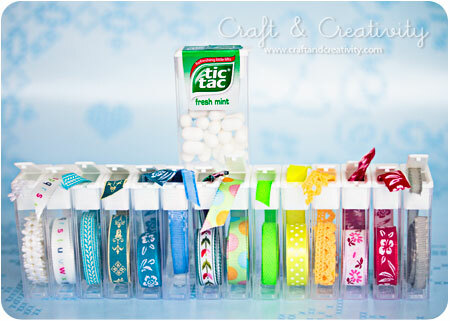 “Plastic bins are a crafters best friends. Sure vintage tins and bowls look better on your desk, but realistically you need something you can see inside and stack. Some crafters work better in carefully curated amounts of chaos. I like to have all my options spread out in front of me when I am working on something. My workspace may look a mess, but I know where everything is and sometimes things spilled on a table next to each other strikes inspiration. 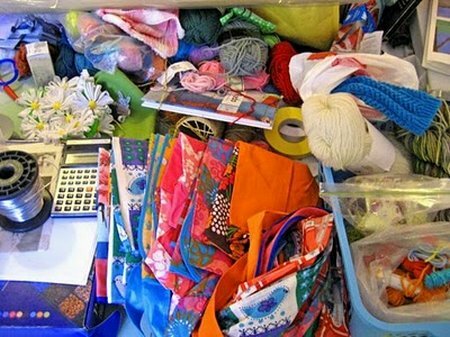 Be mindful of where you put your craft supplies. In my current home I don’t have a studio space, whereas at my old house I had my entire two-car garage converted into a workspace. I put the items I don’t use often in my garage and the items I usually daily in my desk drawers. 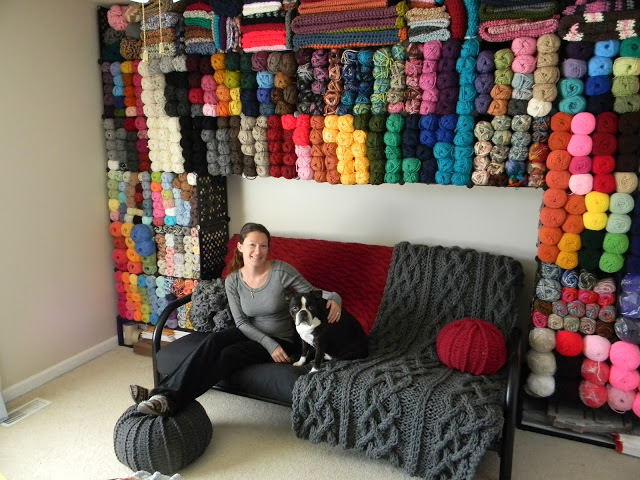 Jennifer shared a craft room tour with MAKE back in 2010. It still holds up. 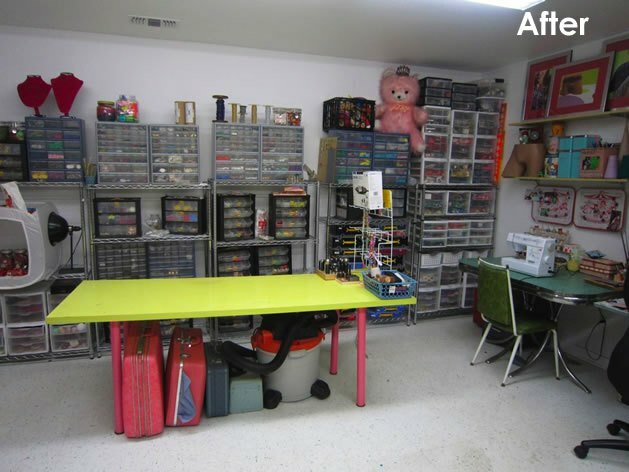 This would make my clutter look so much neater. Download these labels from Ashley Hackshaw right here. 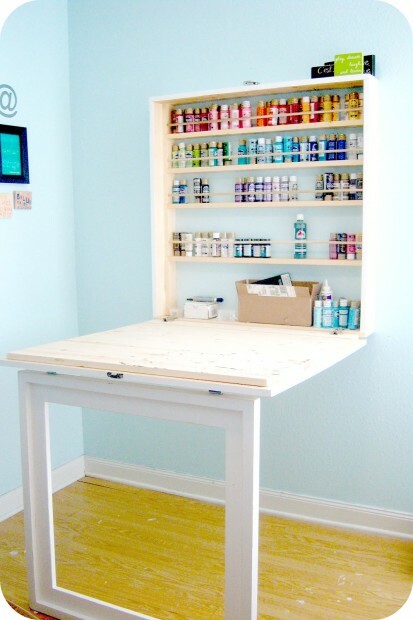 Running out of shelf space?Build this wall-mounted worktable/organization station. Brilliant. Crafty. Discrete. 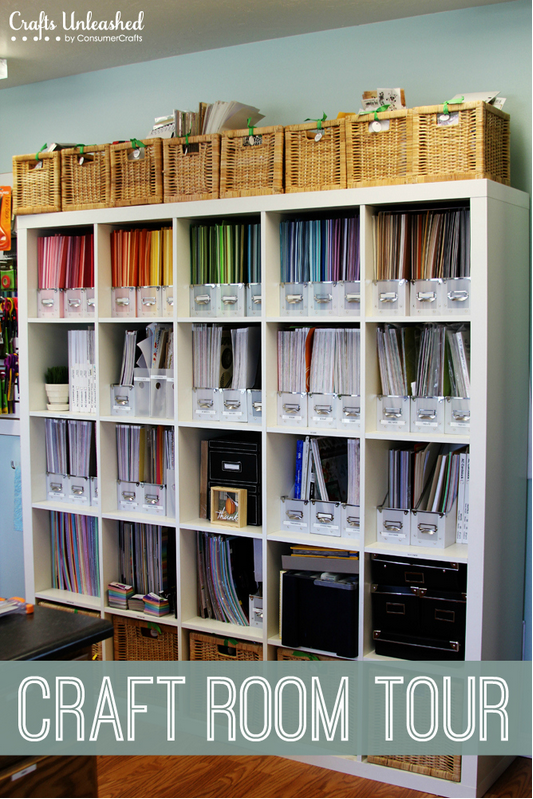 Is your paper collection a lovely heap of possibility? 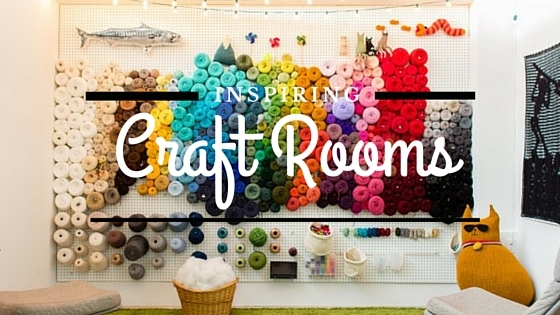 This craft room tour will either spark inspiration, or strike shame into your own unorganized heart. 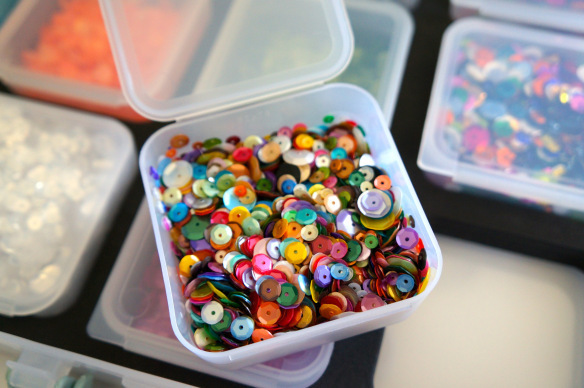 Calling all Magpies and glitter-users, I saw this and thought of you… Sequins and glitter stored neat n tidy at The Crafty Pickle. 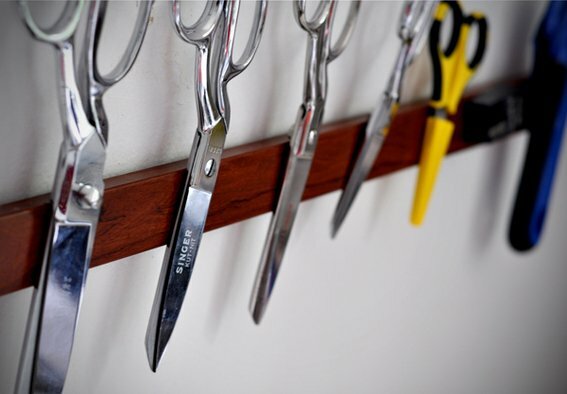 Finally, scissor sisters, I think this modification of the magnetic knife holder we’ve all seen is just plain great when it comes to keeping track of cutters. 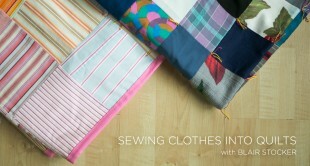 See how it’s made over at Curbly. Looking to add shelving to help you achieve some of this? 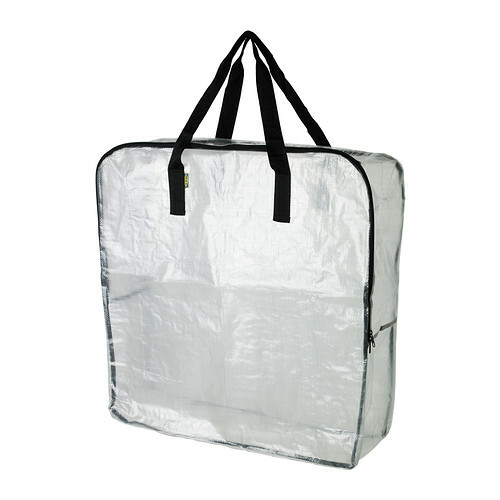 I recommend the Elfa solutions at the Container Store, and just about everything at Ikea.com. Don’t forget to keep an eye out for used bookcases on craigslist and at thrift stores. 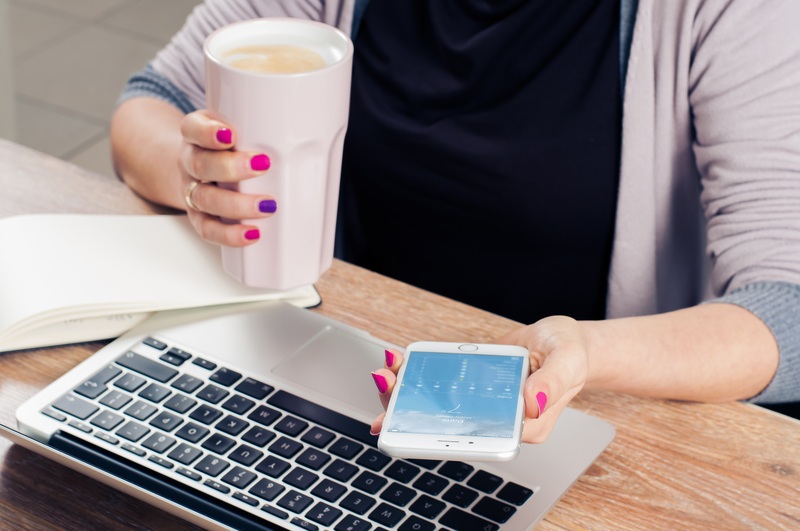 You can make over your creative workspace without breaking the bank, or losing your mind. Just take it one craft material at a time, and don’t forget to breathe! 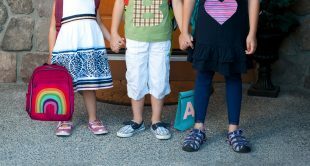 Did I miss any MUST-SEE solutions? What’s your favorite way to stay organized?